Powdercoated, Radiused vertical steel license plate holder with a show polished stainless steel, antique style model A tail light. It also has a all glass lens, with STOP lettering in a contrasting amber color. THIS LICENSE PLATE HOLDER IS PROFESSIONALLY POWDER COATED BLACK. AND HAS A CHROME LICENSE PLATE FRAME. ALL OF THE HARDWARE IS STAINLESS STEEL. ALL OF THE SCREWS AND BOLTS ARE FLATHEADS TO GIVE IT A VINTAGE LOOK. Heavy 1/8th inch thick steel construction with welded fabrication. Designed to fit most any bike by bolting it under the rear axle nut. The mounting hole is 3/4" in diameter. 1" is available upon request. 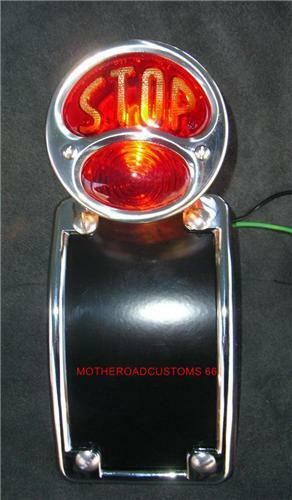 The tail light is a classic Ford model A reproduction, stop light, and license plate illumination lens on the bottom. This will make a great looking, and functional addition to your classic ride. I HAVE MORE TAILLIGHTS AVAILAVLE IN MY STORE. If you have a question you can call me at 314-972-4305. Thank you for shopping at Mother Road Customs, where quality and craftsmanship always comes first. I included a couple pictures of my, mother road, trips.